Cloud DVR and wireless bundle deals make DirecTV Now a lot more interesting. Are live local ABC, CBS, NBC, and/or Fox broadcasts included? What regional sports channels are included? How many devices can stream at a time? Any bundle deals for AT&T wireless subscribers? DirecTV Now has been around since late 2016, but AT&T’s streaming TV bundle got a major upgrade this week with a new interface and cloud DVR service. Editors’ note: This guide, originally published on December 1, 2016, was updated in its entirety on May 16, 2018 to reflect the service’s newly introduced features. DirecTV Now is a streaming channel bundle from AT&T (which acquired DirecTV in 2015). It gives you a big bucket of TV channels for a monthly rate, but streaming through Internet-connected devices instead of a cable or satellite TV box. Pricing starts at $35 per month for roughly 60 channels. This package includes the four major broadcast networks, the major cable news networks, nationally televised sports channels such as ESPN and FS1, and a slew of general entertainment channels. Additional channel tiers are available for $50 per month, $60 per month, and $70 per month. You can also add HBO or Cinemax to any package for $5 per month each, and Starz or Showtime for $8 per month each. Sales taxes may apply, but there are no other hidden fees. Nearly every channel includes a live programming feed, just like you’d get with cable or satellite TV. Many channels also offer a selection of on-demand video, and roughly 40 channels offer a “Rewind” feature that lets you watch anything that’s aired in the past 72 hours. 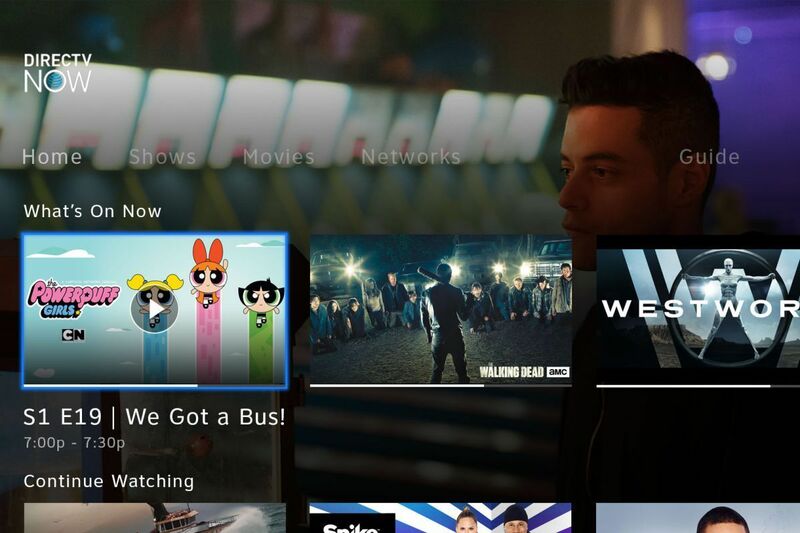 Starting this week, DirecTV Now includes cloud DVR service as a public beta feature. You get 20 hours of recording, stored for up to 30 days, at no extra charge. This summer, a $10-per-month DVR upgrade will offer 100 hours of recording for up to 90 days. In terms of recording hours and storage time, DirecTV Now is the least generous of all streaming bundles, limiting both the amount of storage you get and the time you have to watch those recordings. (Other streaming bundles choose either one or the other.) We’re still awaiting comment on whether DirecTV Now has any other restrictions against ad skipping or recording certain channels. DirecTV Now does offer live, local feeds in many markets, so use the channel lookup tool to see what’s available in your area. If a broadcast channel isn’t available in your area, you’ll still receive on-demand primetime shows the day after they air on TV, but no live sports or news. Use the channel lookup tool to see what regional sports channels are available in your area. The channels you get are based on your billing zip code. DirecTV Now apps are available for iPhone, iPad, Android, Amazon Fire TV devices (second-generation and higher), newer Roku players (see the full compatibility list), Apple TV (fourth-generation and higher), and Chromecast (second-generation and higher). You can also watch with the Google Chrome and Apple Safari browsers on a laptop or desktop computer. DirecTV Now on Fire TV. Although AT&T promised support for Samsung smart TVs a year ago, the app still isn’t available, and there’s no word on support for Android TV, Xbox consoles, PlayStation consoles, or other smart TV platforms. For live local channels, you’ll receive the broadcast feed from wherever you are (assuming live broadcasts are available in that area). You cannot watch your own local channel while you’re out of town. Your regional sports channels are only available when you’re inside the coverage area. This is based on your billing address, and verified by your IP address (for TV devices) or your physical location (for mobile devices). DirecTV Now allows two devices to stream simultaneously. A $5 per month upgrade allows for three streams at once. Of course. The live feeds have commercial breaks just like cable and satellite TV, and ads are interspersed with the on-demand content as well. AT&T has said that better-targeted ads are a big part of its plan to keep prices down. According to AT&T’s website, you can currently save $15 per month on DirecTV Now by bundling the service with an AT&T Unlimited Choice Enhanced or Unlimited Plus Enhanced plan. The former costs $65 per month for one line and has various restrictions on speeds, mobile hotspot use, and video quality. The latter costs $80 per month for one line. Both offerings become cheaper when part of a family plan, and they also include free HBO. Does DirecTV Now authenticate with TV Everywhere apps such as WatchESPN? DirecTV Now currently works with 64 TV Everywhere apps. (See the full list here). As long as those channels are part of your DirecTV Now package, you can use their apps to watch on devices that DirecTV Now doesn’t support, or to watch when all your DirecTV Now streams are already in use. Will NFL Sunday Ticket be available? AT&T has previously said that it’s trying to negotiate a deal with the league, but as of now, Sunday Ticket is only available to DirecTV Satellite customers, and as a standalone streaming service for people who cannot install a satellite where they live. DirecTV Now does not offer the NFL Network or NFL Redzone, either. NFL games are not available to stream on mobile devices, due to an exclusivity deal between Verizon and the league. The same restriction applies to other streaming bundles such as Sling TV and PlayStation Vue. Fortunately, you’ll be able to stream those games on your phone for free during the 2018-2019 season, even if you’re not a Verizon Wireless customer. The process is fairly painless. Just sign in through the DirecTV Now website, and go to Settings > User Account > Manage My Plan. The “Cancel Plan” button is impossible to miss. Head to the DirecTV Now website. If you’re a new subscriber, AT&T is currently offering three months of service for $10 per month. The company also offers a rotating cast of device deals with prepaid service. For instance, you can get an Apple TV 4K with three months of prepaid service or Roku Streaming Stick with one month of service. Even if you have no interest in DirecTV Now, these deals are arguably the best way to buy a new streaming TV device today.